Add the kimchi and stir constantly for about 5 minutes. For even better sabor, add a few teaspoons of kimchi juice. Add the rice and crushed red pepper. Salt and pepper, and stir well. Cook for an additional 5 minutes until all the rice has heated up in a uniform fashion. To obtain the famous "sticky rice," let cook over medium-high heat without stirring for a few minutes. Fry the eggs. 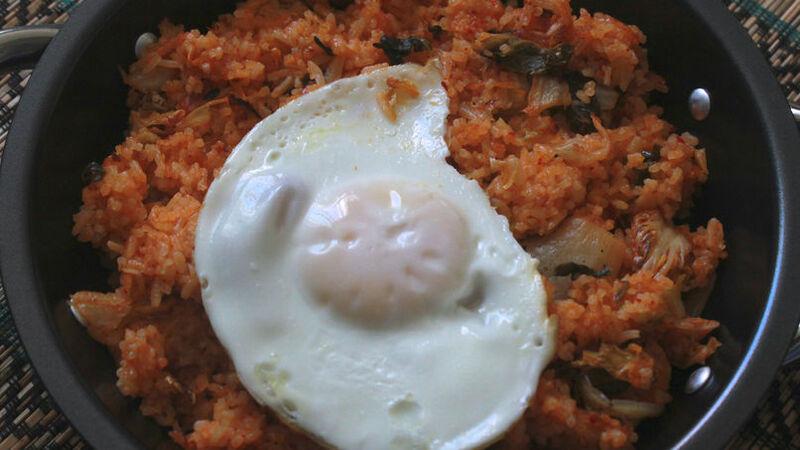 Serve the fried rice with a fried egg over the top. Using rice that has already been cooked is ideal, but you may also cook rice at the time of recipe preparation. Meals with rice are favorites at my house. Generally speaking, we use this ingredient on a daily basis, from deliciosa rice soups to rice pudding. After visiting one of the most famous restaurants in Los Angeles, I felt inspired to prepare a different dish. I made a riquísimo kimchi fried rice. Kimchi is one of the most popular foods in Korea. It has become a hit worldwide for its nutritional properties and fantastic sabor. For this recipe, you can venture out and try to prepare your own kimchi, or purchase it ready-made to save additional time. This recipe is ideal for those days when you have lots of time, or leftover rice on hand.